This horse-drawn buggy was damaged Thursday after it was apparently struck by a minivan on SR 138 at Worley Mill Road. 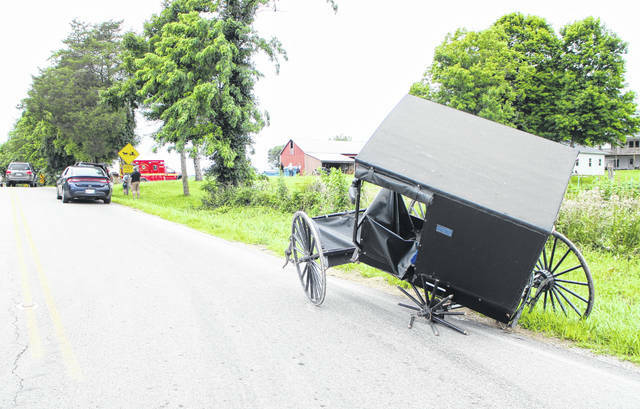 There were no injuries reported Thursday after a minivan apparently struck a horse-drawn buggy carrying a mother and baby on SR 138 at Worley Mill Road. Pamela Ballein, a medical professional, said she was driving westbound on 138 when she saw a minivan ahead of her strike the buggy from behind. Ballein said the van appeared to have struck the buggy on the left side, and the rear left wheel of the buggy was broken to pieces. There was damage to the right front end of the van, Ballein said. Ballein said the buggy was carrying a mother and baby, neither of whom appeared to be injured. The baby was secured in a car seat, Ballein said. EMS personnel on scene said none of the occupants of either vehicle sustained injuries. Rich Hall, another eyewitness, said he was parked at the stop sign on Worley Mill preparing to make a left turn on 138 when he heard the impact. Hall said the horse was spooked and dragged the cart for a distance before Hall’s son was able to get the animal under control. A trooper with the Ohio State Highway Patrol said he did not have any information on the accident because he had just arrived at the scene.